Vertebroplasty is designed to stabilise Vertebral Compression Fractures (VCF) in the osteoporotic bone. 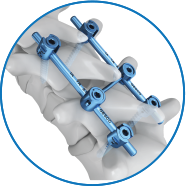 Alpha is a versatile 5.5 mmtop-loading pedicle screw system with the versatility to accommodate complex spinal procedures. Self-tapping threads eliminate the need for tapping, thereby reducing surgical time. Simple instrument set of precise instruments several options for rod manipulation and reduction ensures easy implantation. The exhaustive set of precise instruments several options for rod manipulation and reduction ensures easy implantation. It also includes calibrated torque limiters for precise locking of pedicle screws to rods. The system offers excellent versatility and consists of Reduction screws, sacral screws, hooks, staples and a plethora of connector options are also available. Two types of backbiting forceps are available. One is STAMMBERGER Backbiting Punch up cutting, Cutting to Left and Cutting to Right. The other type is designed by Dr. Sethi called the Sethi Backbiting punch Black finish. It comes in two different types, one is straight and the other slightly curved up. This back biting forceps is slim profile with a strong and precise cutting edge. GESCO manufactures wide range of ear loops and ear curette. We have Bucks ear curette curved blunt in 1.5 mm , 2 mm, 2.5mm, 3mm, 4 mm. We also have Billeau ear loop in different sizes and Billeau wire loop in different sizes - Straight , Angled and Bayonet.